Adam Levine, the talented Maroon 5 lead vocalist, has an interesting life that many people admire. It is truly difficult to think of Adam Levine and not to immediately have an image of intriguing and stunning tattoos; he certainly does have an insatiable appetite for them. Then there’s his brother, who certainly is the sturdy rock on which Adam stands, and the depth of the bond that this two brothers have is a self-evident display of what friendship in a family can amount to. And then of course is his house, which has earned its place in the limelight, because it is a home to be proud of and envied. These elaborate tattoos on his body will catch anybody’s attention, and intrigue many people because there is more to them than meets the eye. Adam does have a large appetite for tattoos and they use up a considerable space on his torso. Adam got his first tattoo when he was 21. It is a dove on his left shoulder. He got it as a tribute to the heavy losses that America sustained on 11th of September 2001 due to terrorist attacks. As he continues to journey through life Adam finds it wise to engrave those moments in his life that have special meaning onto his own body in the form of tattoos, though occasionally he will get a tattoo for an apparently fickle reason. Here’s an outline of where the tattoos are on his body, and the reasons why he got them. One tattoo for which he gives no reason for attaining even though its role in enhancing his appearance is no mean achievement is a black beaded necklace around his neck. This he got in Japan. Asked why he got it, he jokingly said that it’s there to ensure that he never lacks a necklace. Really Adam? He also has a sunflower at his right peck, which he says resembles a delicious cabbage but which also serves to compliment his abs. On his left peck is a Sanskrit word,” Tapas” which means warmth, fire or passion. It tells the whole story about his love for Yoga. There is an eagle that is perched on his abs. He says that he got it as a reminder of what an interesting journey life has been. Many people will find it difficult to relate the two, and I honestly can’t blame them. Then there is a True love gypsy hand and the word California on his left peck abs, which is a tribute to his home state, which anyone would be proud of. Then there is a mysterious illegible cursive on his right biceps, and it remains a mystery. 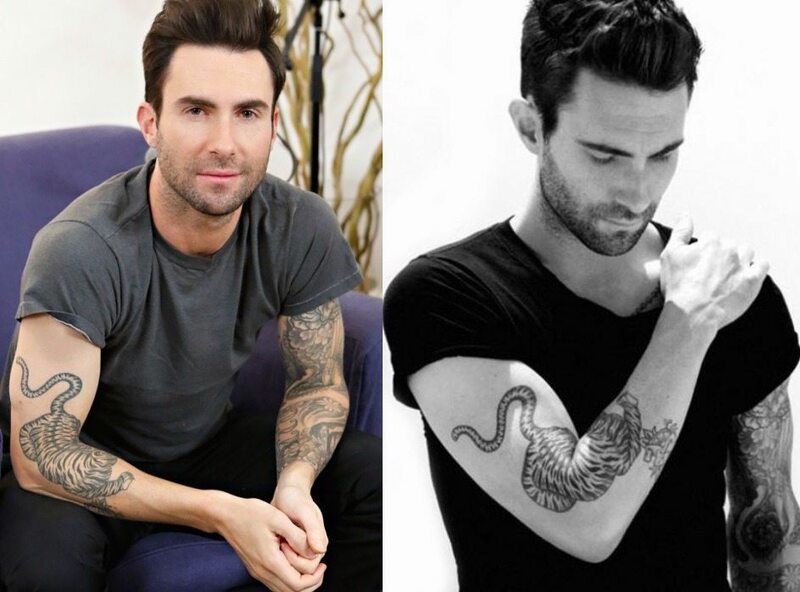 Adam also possesses a tiger on his right elbow, which he says was inspired by his love a Tibetan drawing book. Then in an effort to gain his mother’s approval of his tattoos, he has a Mom heart on his right forearm. Adam also has a guitar on his left arm, for his love of the instrument, having been the lead guitarist of the Kara Flowers band, which is the band from which Maroon 5 originates. He has an X on his left bicep, which is the Roman numeral for 10. He got it to mark the 10th anniversary of Maroon 5’s existence. He has the name Los Angeles engraved on his right shoulders, for the love of his hometown. He has a cute shark drawn on his right ribs, and he says that this is because sharks rank high in his list of fascinating creatures on earth. He has the number 222 on his left forearm. The number is of sentimental value to him, as it was the door number of Maroon 5’s first recording studio. Adam says the feather tattoos on his arms keeps him warm at night. To crown it all, Adam has an elaborate tattoo that fills his entire back. Its centre of attraction is a mermaid holding a skull, in an otherwise sea scenario including a ship, a ship wheel, flowers, billowing clouds the sun and a lot of other things. The tattoo completely covered the previous tattoos on his back which included a drawing of a model (which apparently signifies his love for Victoria Secret models), a dog’s paw with the name of his dead golden retriever Frankie Girl. Adam gave fans a first look at the tattoo via a pic posted on his Instagram page, he revealed it took 6 months to complete. If this is not the ultimate definition of a tattoo lover, I don’t know what is. He is Adam’s younger brother. The two brothers have a very close relationship which explores bonds of both family and friendship. Michael is openly gay, and Adam rallies behind him giving him his full support. Their love for each other is also made evident by the number of concerts that Adam drags Michael into. All in all, these two model the kind of friendship that siblings ought to have. Celebrities are fond of flipping homes invariably and Adam is no different. The Maroon 5 frontman once lived in a 1940’s bachelor pad in Bronson Canyon, Los Angeles whose interiors were remade by top interior designer and friend of Adam, Mark Haddaway. Adam sold the house in 2013 for $3.5 million making a profit of over 300k. The sale was after he had moved like Jagger into a more sprawling bachelor pad in a gated Beverly hills enclave known as Wallingford Estates which he bought in 2012 for around $5 million. Prior to his 2014 marriage to Victoria Secret model Behati Prinsloo, Adam refurbished the 6-bedroom Beverly Hills mansion to include an additional bedroom, a guest suite and a recording room. Apparently he was preparing for the arrival of the Mrs.
After the pair got hitched, they bought their first property together, a commodious loft located in the luxe SoHo New York at 112 Greene Street for $4.55 million. The 2,700-square-feet co-op features 13 ft high ceilings and hardwood floors. As of April 2016, the house is listed with Oxford Property Group at the asking price of $5.5 million, over a million more than they bought it in 2014. In March 2016, Adam and pregnant Behati were spotted house-hunting in Pacific Palisade, California. It appears the couple need a bigger house to raise their imminent baby girl, Yes! It’s a girl, the couple revealed so. If the expectant couple eventually buy a new LA mansion, it will come as no surprise to see them part ways with their Beverly hills estate also known as Benedict house as it sits on a 3.66 acre piece on the Benedict Canyon area of Beverly Hills.